Read the original story with a video report: click here. Over the last year, the intersection of Douglas and Rutan in College Hill has gotten a bit more dense. In the shadow of the 10-story Hillcrest Apartments, a new four-story apartment complex — Uptown Landing — has slowly taken shape. The sleek new apartments at 148 N. Rutan are now leasing, and Kim Ostrom, property manager, said she’s already received plenty of interest, despite being on the tail end of leasing season. “I think (the apartments) will rent very quickly, (judging) by how many we’ve leased by the time we were able to tour,” she said. “A couple months, probably.” The building is a mix of residential and commercial space — with 51 apartments occupying the second, third and fourth floors of the building. A fancy French/Italian restaurant is currently in the works for the ground floor, called Vora Restaurant European. The apartments themselves are a stark contrast from the surrounding College Hill neighborhood, made up of quaint, century-old houses. Ostrom said she thinks that’s part of Uptown Landing’s appeal. “We’ve heard from a wide range of people — anywhere from people already in College Hill that are looking to downsize … to a lot of young professionals,” she said. The apartments are on par with any new downtown developments, but with an added perk: A Dillon’s grocery store is a short walk away. “We have a lot of convenience, with being able to walk to the grocery store, to restaurants, to entertainment,” Ostrom said. “There’s just a lot of convenience being right here that a lot of other (apartments) aren’t able to offer.” The apartments all feature stainless-steel appliances, kitchen islands, walk-in closets and double-vanity sinks in the master bathroom. All of the hallways feature neutral gray and brown tones with white doors. Apartments rent anywhere between $1,100 per month for a 734-square-foot one-bedroom to $1,900 per month for a 1,381-square-foot three-bedroom. The building features a rooftop patio — called the Sunset Terrace — and each apartment has its own balcony. The city skyline is visible in west-facing apartments. There is a gated parking lot with garages available to rent, as well as covered carports. There are also uncovered parking spots for residents. Most of the amenities for Uptown Landing have not been built yet, though — “Phase Two” of the development, which will be built just north on Rutan to First Street, isn’t expected to be complete before 2020. The second development will feature about double the apartment units, a resort-style saltwater pool, a community clubhouse, another rooftop patio with indoor clubhouse space available, as well as outdoor kitchens, a fitness center, pet-wash station, and a car-care center. Current tenants will eventually have access to those amenities, though they’ll have to wait until the new complex is built, Ostrom said. 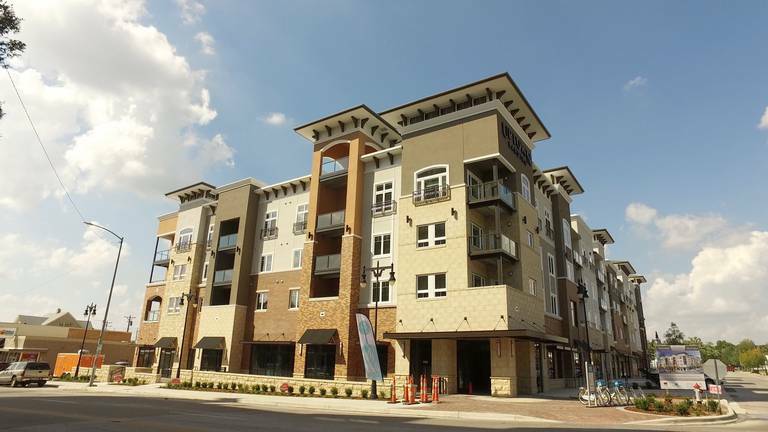 The apartments are managed by Weigand-Omega Management, which also oversees Wichita complexes like Twin Lakes Apartments, The Timbers and Sleepy Hollow Apartments. For more information, visit www.uptownlanding.rentourspace.com or call 316-272-6044.